I have to admit. As frustrating it sometimes is at work, I have to say, the ability to have a four day weekend helps ease the tension. I enjoyed my four day weekend. I got some quality time in with the Leeroy Monster over a couple of good long runs (he is my brothers dog, and not a monster in the scary sense). I spent the day with my WBC crew and picked up some interesting finds at the Brooklyn Flea Market, including a couple of cookbooks from the 1930’s and 60’s. 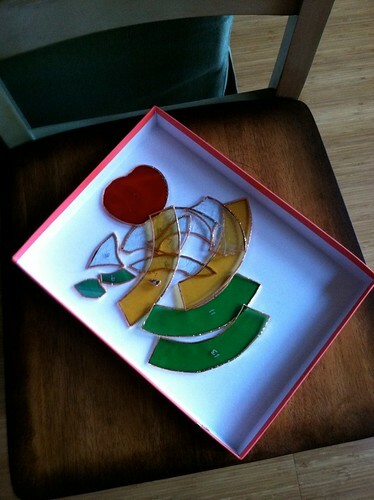 I foiled my pieces for my stained glass workshop (homework) and manage to cut my finger in the process (not deep enough to draw blood, but deep enough where it hurts, especially when surrounded by the juices of a citrus fruit). I also received an Liebster Blog Award from My Baking Empire! My Baking Empire is a wonderful baking blog filled with incredible treats that keeps me inspired to bake and keep up my workouts so I can enjoy whipping some of her recipes up, more or less guilt free. A Liebster Blog Award is given to talented bloggers who have less than 200 followers. “Liebster” is a German word that means “Dearest”, it also means ”Favorite”. So, in a way the award not only recognizes these bloggers as amazingly gifted in their own right but also as your very own personal favorites. Steps four and five are a bit tough since I don’t follow many blogs. So, with that, I am instituting the Slap-Bet rules from How I Met Your Mother. Over time I will award 5 Liebster awards to blogs (with less than 200 followers) as I see fit. They can be awarded anywhere, at anytime, and everyone here will be my slap-bet commissioners. In order to continue earning my keep, it’s back to work! The problem with long weekends, is that, after a week of eating relatively well, I end up eating relatively poorly when I am no longer under the structured schedule of a typical work day. On Friday I feasted on Burgers and a Beer at Little B’s in Tarrytown. Saturday was a Flopover and Popover with some amazing strawberry butter from the Popover Cafe on the UWS of Manhattan followed by Matzo Ball soup and half a pastrami sandwich for dinner and cookies from Levain Bakery (6 oz cookies is a lot of cookie. Really delicious, and very well made, but way too sweet for me. It’s a sharing cookie.). I needed something light after all this heavy food. After picking up my parents from JFK on Sunday, we stopped in Flushing for some Dim Sum (more diet unfriendly food!) and produce shopping. Fruit for the week on the cheap! I was particularly excited because this also meant I could pick up a Pomelo. 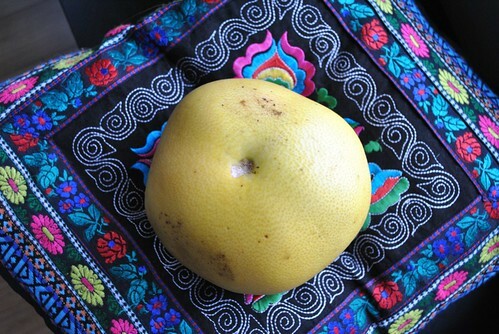 To me, a Pomelo is a cross between a grapefruit and an orange. 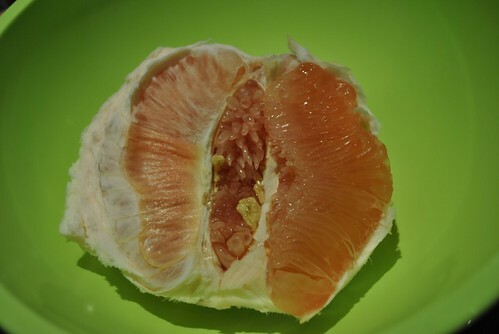 It has the grapefruit coloring and flavor, but much more enjoyable to eat due to the sweetness of the orange part of the family. They are pretty large, and I got my smaller one for $1.99. My mother got a larger one for $2.99 (that is the price for each). How do you pick them? Like all citrus (and really, fruit in general), pick one that is heavy for its size. My mother also told me to look at the top. If it’s flat, then don’t take it. If it has bulges on the top in a kind of three point start like pattern, then it’s a good one. To eat a pomelo, what you have to do is take a good sized knife (I use my trusty chefs knife, my mom uses her trusty cleaver) and just cut off the outer skin, like you’re peeling a butternut squash, except a ton easier. Don’t worry about the abundance of pith, you are basically just removing the outer layer so you can break this puppy open easier. Once the outer layer is gone, break it open like an orange. Don’t bother trying to separate out the slices, just break it into chunks if your sharing, otherwise just leave it as is. If you are going to just eat it as a snack, then you just start on one end of a chunk and peel off the inner pith until you get to the flesh. Eat the flesh and repeat. The last two times I was in Hong Kong, my cousin brought me to this Thai hole in the wall joint in Sai Kung. That is where I discovered and fell in love with the Thai Pomelo Salad (Yum Sum O). Since this dish is not one to be found on this continent, and I don’t think I’m going to be returning to Hong Kong (or going to Thailand) anytime soon, I figured I try to make this one myself. Harvest enough pomelo flesh as you want to eat. Break it up into small chunks and put into a bowl. Crush up some Roasted Peanuts (unsalted, and about a handful) and put aside. I put the peanuts in a bowl and just used the end of my rolling pin (I have a french rolling pin, so use anything with a wide flat end). Technically you should use a morter and pestle, but seriously, I did not have one, and I was too lazy to pull out the food processor for this one. 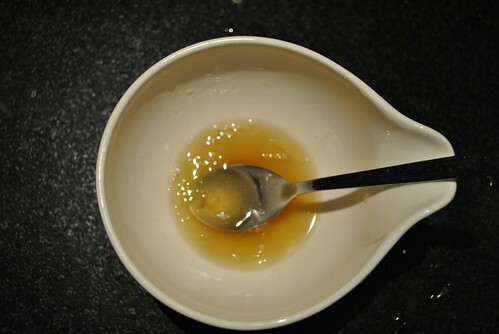 For the dressing: Mix together about 1 tablespoon of fresh lime juice, 1 tablespoon of fish sauce and a teaspoon of brown sugar (or more to taste). Cut up a scallion into thin slices. Thinly slice a shallot. Then fry up the shallots in a small pan with some oil until they are golden brown and crispy. Remove from the pan to dry. If you really don’t want to turn on the stove, or are like me and afraid of your super sensitive smoke detector, you can use store bought fried onion or shallot stripes. One option is to also cut up a little chili too. I like it with a touch of spice, but I didn’t have one on hand today, so I skipped it. One recipe also mentioned the use of red chili flakes, crushed up a bit with your fingers. Also, feel free to add toasted coconut flakes into it also. I would have except my local Stop and Shop did not sell unsweetened coconut flakes, which was really odd. 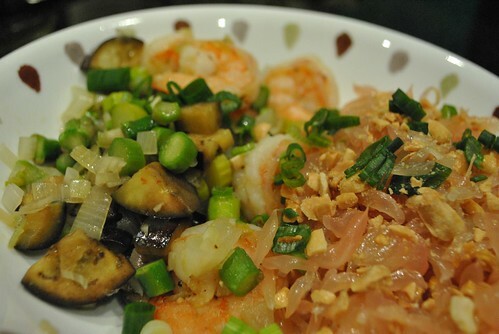 Once everything is gathered, I tossed together the pomelo, peanuts, scallions and shallots (chilis if you are using them). Then I drizzled in some of the dressing and tossed some more. Add as much dressing as you want, toss, and top with some more peanuts and scallions. Done and done! 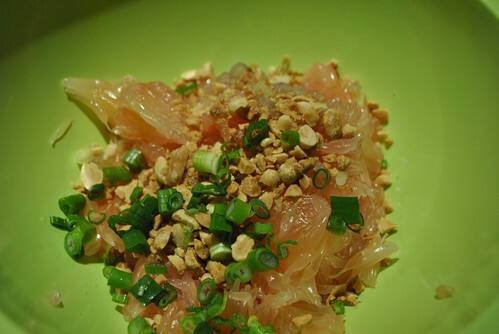 A pomelo salad. It wasn’t really close to the deliciousness of the one I had in HK, but the main flavors where there. The lime against the pomelo with the crunch of the peanuts and shallots. I served this one with a sautee of shrimp (marinated in lime juice, salt, pepper and minced garlic), asparagus, shallots and eggplant. It was light and refreshing and chock full of nutrients. Perfect after a calorie binge. This entry was posted in Fruit, Salad, Uncategorized and tagged Fruit, Pomelo, Salad. Bookmark the permalink. First off, I love the slap bet idea for the LIebster Awards. Secondly, I don’t think I’ve ever heard of a pomelo, but it sounds tasty, and so does this salad! The pomelo salad we had in HK was unbelieveably delicious! I love that you paired your version with shrimp. Yum!